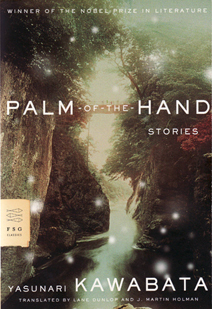 This book gathers Nobel Prize winning author Kawabata’s famous short shorts, or “palm of the hand (tenohira) stories.” These stories average about two and a half pages each, although some are a little longer, and some are much shorter. Most of these stories deal with the intricacies of male-female relationships, dreams, and fragmented memories of childhood. Even though some of the stories have a bittersweet sentimentality, Kawabata’s style is mainly realistic, especially in his portrayal of relationships crippled by words left unsaid and small, but meaningful, actions. Some of Kawabata’s short stories are lyrical in their depictions of time, place, and nature, but many strike the reader as small mysteries to be pondered and unlocked. Who said what to whom? What significance did that have? Why would this person do that? What exactly is the relationship between these characters? The extreme brevity of these stories boils down life stories into a few irreversible moments and leaves the reader to read between the lines. This aspects of the works is rewarding but can be occasionally frustrating. These stories were written over a period spanning between 1923 and 1972. Read individually, they can be unsatisfying; but, if the reader reads one story after another in a smooth, unbroken stream, the major themes and concerns of Kawabata’s career begin to gain a greater clarity, and the stories meld seamlessly into a greater whole. I have read several of these stories in Japanese, as they are quite famous, and I have found that the translations are not only accurate but successfully convey the tone of the originals. The stories translated by Lane Dunlop (Shiga Naoya’s The Paper Door and Other Stories) tend to be a bit dry, but they are balanced nicely by Holman’s more experimental style. Nice. I really like Kawabata. I’ll have to check this out.